Me, Myself, and I Am Giveaway! About the Book: A new experience of God comes one question at a time in this fun and provocative journal. 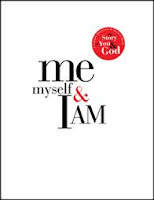 Made up entirely of insightful, profound, and occasionally ridiculous questions, Me, Myself, and I AM invites you to open to any page, open yourself to God, and be the author of your own story. Do you believe that all of Jesus's followers have a responsibility to tell others about him? Me, Myself, and I AM will entertain, inspire, and get you thinking about your spiritual life from brand new angles. Whether you use Me, Myself, and I AM as a reflective tool, a way to start conversations with friends and family, or as a spiritual time capsule to look back on years later, their own words will create a powerful journey of self-discovery. GIVEAWAY: I have a copy to giveaway! Just leave a comment if you are interested with a valid email address. Open worldwide. I'll email the winner next week. I would love a chance to win this book! Will help on the self-improvement work! Wow! What a unique concept! I'm always looking for journals like this! I'd love to be entered. I'll take one right off your hands for you! I love spirtual books especially ones like this one that are interactive!!!! ABSOLUTELY!!!!! I AM VERY INTERESTED! Please count me in, it all sounds great!!! Sounds wonderful. I want to read it. I would like to win this. It sounds like a great book to get to know yourself a little bit better when it comes to your faith and Christ. I wish to win this book too! This sounds like something I could really use right now. If I don't win I think I'm going to go buy a copy. Thanks! Sounds like a fun read. Please enter me in the give away. This sounds very cool - thanks for the chance to win! Sounds like a must read, thanks for the great giveaway! This sounds like a great book and definitely something I could use. Thanks for the give away! If I'm not too late ~ please enter me to win a copy of this book.